The days of expensive electrical products are over. In these modern times you can enjoy a remote control for your TV, DVD, Stereo and much more, all at inexpensive prices. Now you can enjoy Powered Curtain Tracks and blinds without breaking the bank. Motorisation means you don't even have to get up from your chair to open or close your curtains or blinds and you don't have to handle your curtains / blinds which remain clean and fresh for longer. Manual operation is still possible, for example during power cuts or if you misplace the handset (with certain models). A Timer unit can be programmed to automatically open and close your curtains / blinds at your preset times or maybe a light sensor is just what you need. A light sensor detects the light outside so when the sun starts to shine in the morning, your curtains / blinds will open and when the sun sets in the evening, the sensor reacts and Close's your curtains / blinds automatically. This is a great security device, as the sun does not run on a precise clock, so when you are away your curtains / blinds will move at different times of the day, given the sense that someone is at home. With the introduction of PowerView, a revolutionary new system allows you to control your blinds from anywhere in the world. A revolutionary new system that automatically moves your blinds throughout the day! Imagine a world where window treatments anticipate your needs and adjust themselves automatically, creating the perfect room ambiance morning, noon and night. 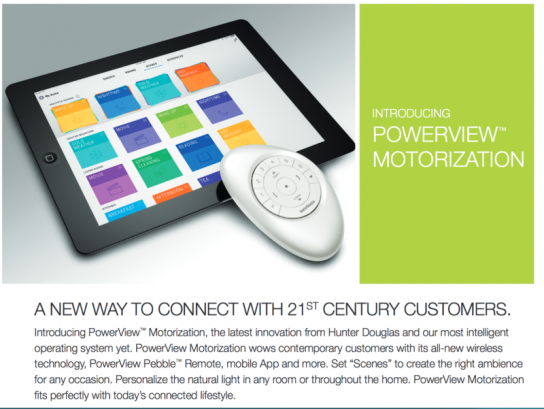 That’s the beauty of PowerView™ Motorisation. 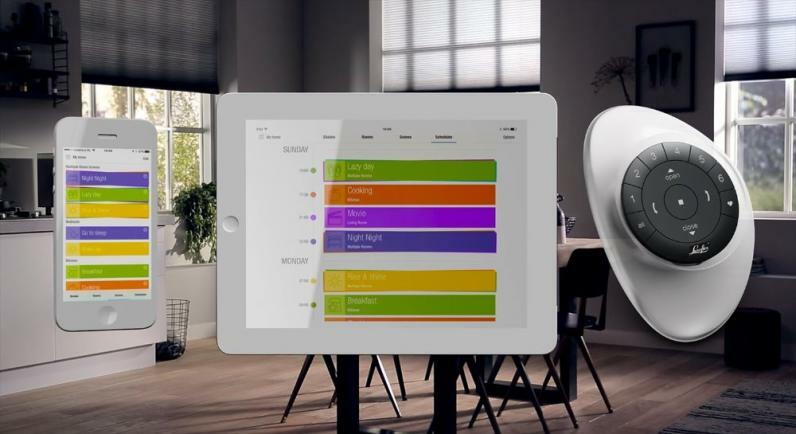 Just program PowerView™ to move your window treatments to the exact position you want and then control and schedule them using the intuitive PowerView™ App on your smartphone or tablet, which means you can control them from anywhere in the world. You can also operate your PowerView™ settings using the stunning new PowerView™ Pebble™ Control. Available in an incredible range of sophisticated styles, PowerView™ Motorisation creates a whole new world of beauty and convenience. You dont need to have electricians or builders making a mess as PowerView is completly wireless incluidng the blinds which use the latest in Battery technology. The New Electrically Operated Metropole 6150 by Silent Gliss cleverly fuses the elegance of the Metropole with the functionality of an electric track. There are 3 electric track options: System 5090, 5200 and 5400 to suit light to heavy weight curtains which can only be used with the 50mm Metropoles. These Systems offer a multitude of control options including a wall switch, timers, Light sensors and the Ultimate Remote Control. Maximum system width is 5 mtrs. System comprises 24volt motor set including power unit and switch. Choice of basic model with wall switch, (5090), With remote control (5090IR), with timer light set (5090TL) or with all Options (5090TC). Can be equipped with the manual overide feature. Available with Wave Standard curtain heading. Excellent security device when not at home. For contract and residential use. Maximum system width is 10 mtrs. System comprises 24volt DC motor with either 9040 or 9041 motor systems. Can be combined with the radio remote control system 9940 / 0450. Various other operating systems available. System is equipped with either motor 9020 or 9021 (90-260VAC). Option of integrated radio receiver compatible with 9940/0450 Systems. Exceptionally quiet Motor (<45dba (30cm). Motorised curtain track system, for Light to Medium weight curtains. Automatic End of Travel Stop. Can be Bent for bay windows. Max 2 bends per system. Each System is supplied fully assembled, Made to your exact size so can not be cut down. Can use the Wave curtain heading system. The Basic system offers operation via a fixed manual wall switch. System 5090 IR with Remote Control. System 5090 TL with Timer Light Unit. Open and close with Switch on timer unit. Open and close at pre-programmed times using the timer unit. Open and close using the dawn to dusk light sensor. Can also be set to close the curtains for direct sunlight given protection from light damage. System 5090 TC Total Control Option. For the ultimate in control. This system combines both the infrared set and the timer light set to give total control. Stacking: Single, Pair and Equal Multiples. Available with Wave Standard & Wave XL. Equipped with 24v DC Motor 9040 or 9041. Can be combined with Radio Remote control systems 9940 / 0450. Horizontal, straight and curved applications. Can be equipped with manual overide feature. Ceiling or Wall Fix, Recess fixing possible. The motor can be mounted Above the Profile. Standard Colours are white powder coated or anodised Aluminium. Curtain travel speed 15cm / sec. 2 Channel curtain track system. unlimited overlapping of the curtains without the need of an overlap arm. Equipped with a 24v DC motor 9040 or 9041. Stacking: Single, Pair, Equal Multiples and asymmetric applications. Standard Colour is White powder coated. For Contact and Residential use. Option of integrated radio receiver, compatible with radio remote system 9940 / 0450. Various other operating methods available. Standard Colours are white powder coated, anodised aluminium, bronze or black. Exceptionally quiet motor ( <45dba (30cm)). Available with Wave Standard and Wave XL. Curtain travel speed 16cm / sec. compatible with radio remote system 9940/0450. Standard colour is White only. Curtain travel speed is 16cm / sec. 3 Channel curtain track system. For Medium to Heavy commercial and professional use. High standards of performance and versatility. Multiple motors can be individually and/or simultaneously controlled with cost effective and simple low voltage wiring ( No relays). Can be Single or multiple operation. Smooth silent operation with roller gliders. Unique cylinder belt given strength with reduced friction. Motor can be positioned above profile in hollow ceiling. preferably ceiling fixed but wall fix brackets available. Multiple and asymmetrical Stacking, the most flexible of all systems. Colours are Silver or White. Can be combined with radio remote systems 9940 / 0450. Manual operating crank available in case of power failure. Speed of Travel is 30cm per Second. Exceptionally neat profile for the size of system, especially compared with traditional stage tracks. Wide choice of Stacking options including multiple stacking. Profiles can be mounted in parallel for increased overlap. Floor or Wall mounting of motor, can be mounted above track . Non stretch steel core rope in internal channels. 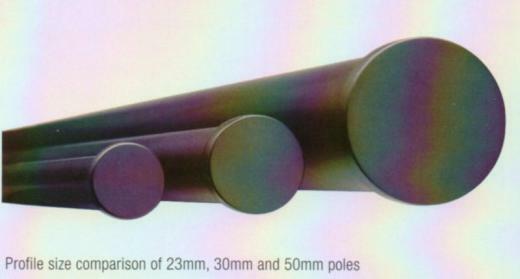 Can be combined with Radio remote system 9940 / 0450.
systems may be upto 60 mtrs long and curtain weight upto 270 kg. Motor Speed 20cm per second. For use with Silent Gliss type A, AA, B, BB and C motors. Radio controlled - no wiring from switch to control box. Up to 255 house and 255 room addresses. Simple multi-switch possibilities without complex cabling. Control of up to 8 motor groups (can be A, AA, B, BB and C mixed) both individually and simultaneously from a single gang switch. Ability to interface with RS232 and RS485 communication protocols on request. Wall switches available in either mirror polish, brushed stainless or brass finish. Black pattress box as standard, white box available on request. In some situations a booster may be required for distances over 15m. Ask Silent Gliss. Pulse function allows slat tilting action on vertical and venetian blinds. The Somfy brand offers a virtually limitless number of solutions. Somfy motors and automatic control units can be adapted to fit almost any type of blind, curtain, awning, garage door or gate, regardless of the environment, the climate, the installation conditions or the number of safety devices required. If fact if you already have an electric awning or blind, then the controls and motors are probably already from somfy and you have been using them for some time. Somfy can provide you with a control system to suit your lifestyle requirements. Whether you want to control your curtains yourself or leave the automatic sensor to do the work for you, somfy has the solution. Powering and moving the openings in the house by means of Somfy motors, controls and automatic devices to make life easier, safer, more comfortable... and to save energy. With Home Motion by Somfy, your home becomes both safer and more private. You have more living space and it enables you to lower energy consumption. You can lower your conservatory blinds with one click. Close your garage door from your car, tilt your Venetian blinds from your armchair, and take advantage of the sun out on your patio without moving from your lounge chair. Home Motion by Somfy really makes your life easy! There is a wide range of Somfy motors, for new buildings or renovation projects. Each is specially designed for the equipment it operates. 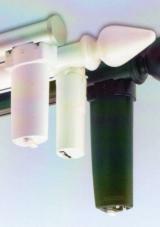 - An awning motor runs smoothly so as not to damage the fabric. - a roller shutter motor stops automatically if it encounters an obstacle or if it is frozen. - a garage door motor fitted with a battery back-up pack will operate even in a power cut. - a gate motor can keep the gate closed. - motors for interior shades are particularly quiet. these are used to control the motors that raise, lower, open, close or direct the equipment. - Wall mounted control unit, usually on the wall, close to the application, controlled either by radio or electrically via wires. - Remote control unit, this means you are free to control equipment from a distance with a portable handset, wherever you are in the house. 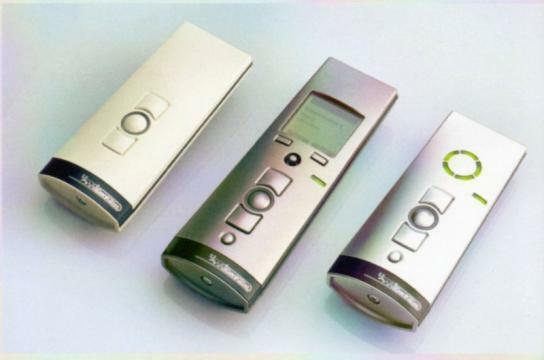 Automatic devices, you can plan or delegate opening and closing functions in your home. Plan using the programming function, this provides an automatic function: there's no need for you to do anything. For example - open and close your blinds at predetermined times, automatically close your roller shutter at nightfall with the "twighlight function". - a wind sensor triggers your awning so that it reacts to prevent the fabric from getting ripped.